‘From my experience, I found many UP Chairs confuse village courts with shalish (traditional mediation). To overcome this conceptual limitations, orientation on village courts is extremely important’ said Mr. Md. Salauddin, Deputy Commissioner, Panchagarh during his inaugural speech in a day long orientation organized by Boda Upazila Administration, Panchagarh. This orientation was organized for UP Chair and Secretaries from 10 Unions Parishads of Boda upazila. 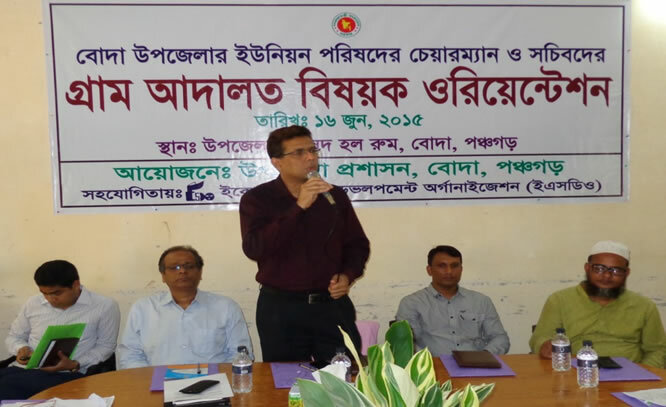 UNDP’s Activating Village Courts in Bangladesh project provided technical support to this scaling up initiative commissioned by local administration on 16 June 2015 at Upazila parishad hall room, Boda, Panchagarh. To expand the support beyond project area, the AVCB project’s initiative was highly appreciated by the local administration in increasing knowledge and skills of the UP Chairmen and Secretaries for running Village Courts in a smooth manner. The orientation was enriched with the participation of Md. Salauddin, Deputy Commissioner, Panchagarh as Chief Guest. On behalf of AVCB Project Mr. Sarder M. Asaduzzaman, Project Coordinator was present and highlighted the thrust of the project in activating village courts all over the country. Mr. Md. Abu Awal, UNO, Boda upazila chaired the inaugural session. Besides, two technical persons from AVCB project Mr. Anamul Khasru, Training Officer and Mr. Uzzal Bhattacharjee, Legal Expert a.i, facilitated the orientation with different presentation and discussion sessions. The orientation was very helpful for the participants in having a clearer and common understanding on VC Act, Rules, trial procedure as well as in writing order sheets. AVCB project extended similar forms of technical supports in orientations in Patuakhali and Jamalpur district as a part of its scaling up intervention.